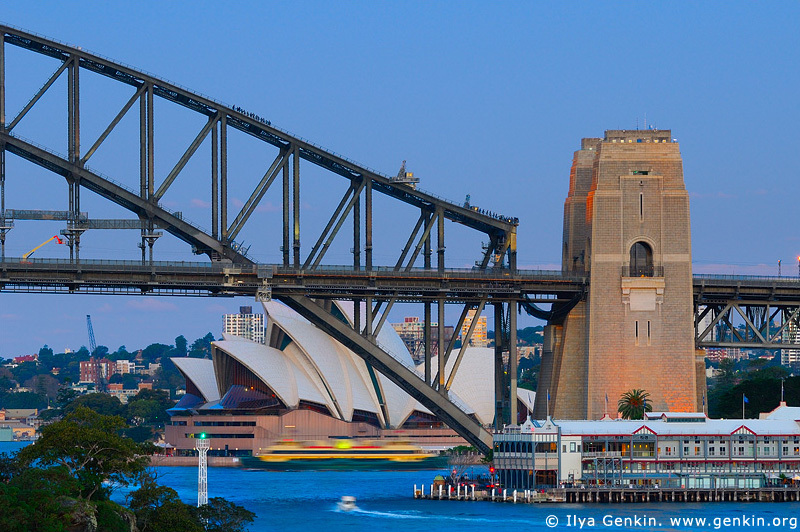 12 Best Photography Spots for Classical Sydney Skyline. Photography Guide. I'm often asked by people who are travelling to Sydney what to photograph there, what are Sydney's best sunrise and sunset locations. So I've decided to write down some notes about shooting Sydney and about best photography spots. For Sydney skyline to be precisely. It's not a comprehensive Sydney city photography guide but it will give you a good idea of shooting locations around Sydney CBD (i.e. downtown), when to shoot there and how to get there. It could be very useful if you have limited time but still want to get some nice photos. By browsing through the images in this guide you can decide where to go to get the view you want. Photographers, whether they are hobbyists or professionals, oftentimes explore a place much differently than a typical traveller. With camera in hand and in search of the best photo opportunities, they are looking for better lighting and better compositions. They want the angle, the mood, the light and some magic. You can find all that in Sydney as well but if you're a first time photographer to Sydney, this photographer's guide to Sydney skyline could be useful to you so you can head straight to the photo booty, so to speak. These 12 spots cover almost all classical Sydney city views. However there are endless possibilities and angles to shoot Sydney and famous Sydney icons along the shorelines. All these places and lookouts are easily accessible by foot, public transport or by taxi/car. I also provided links to Google Maps and The Photographer's Ephemeris (TPE). Mrs Macquarie's Chair is elevated spot and offers excellent view to the Sydney Opera House and the Harbour Bridge. The Kirribilli and Mrs Macquarie's Chair lookouts are two the most well-known lookouts and provide the most classical views. This lookout is located at the Milson's Point ferry wharf, near the Luna Park entrance. It provides a great view to the Harbour Bridge as the main point of interests and the city and Sydney Opera House in the distance. Parking is available on the South Drive, but it could be difficult to find a spot in the evening. You can also use trains to get to the Milson's Point station. 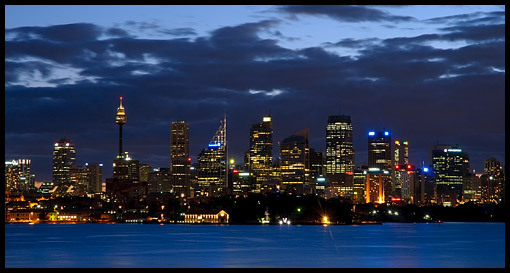 The best time for photography from Milson's Point is late afternoon, around sunset and after sunset. You need ultra-wide or wide-angle lens for this spot as the Harbour Bridge is very close. The Pylon Lookout is located in the South East Pylon of the Sydney Harbour Bridge. It offers spectacular views of the Sydney Harbour Bridge, the harbour and the city. Access is via the pedestrian pathway on the Eastern side of the Bridge from the city side (use the "Bridge Stairs" in Cumberland Street, The Rocks). Or if you are coming from the North side use the steps near Milsons Point Railway Station. Admission fee is $9.50 for 13 years and over. The best time for photography from Harbour Bridge pylon is in the afternoon and before sunset (May - July). It's not possible to do sunrise and sunset sessions as it opens at 10 AM and closes at 5 PM. So pre-sunset shots can be done only from May till July when sunset is around 5 PM. You need wide-angle and mid-range lenses for this spot. These two points are located at the end of Blues Point Road in McMahons Point suburb. They are providing almost identical views of the Sydney Harbour Bridge, the harbour and the city. Parking is available at the end of Blues Point Road. You can also get there by a ferry. If you want to use a ferry then check Darling Harbour, Parramatta River and Balmain/Woolwich ferries timetables in advance at Sydney Ferries web-site, especially if you want to shoot sunrise or sunset. The best time for photography from McMahons Point is late afternoon, around sunset and after sunset. You need full range of lenses for this spot depending on what you want to shoot. Telephoto shots from there could be also very nice as well as wide-angle shots. Cremorne Wharf is located at the end on Milson Road in Cremorne Point. It offers a great view of the city, the Opera House and the harbour. The Harbour Bridge is slightly closed by buildings. Parking is always a big problem there at any time. If you want to use a ferry to get there then check Mosman ferry timetable in advance at Sydney Ferries web-site, especially if you want to shoot sunrise or sunset. You can also use bus route #225 to get there. However the bus route #225 is local so you need to use another bus to get to your nearest #225 bus stop. For bus routes and timetables use Sydney Buses web-site. The best time for photography from Cremorne Wharf is pre-dawn, around sunrise, around sunset and up to 1 hour after sunset. You need full range of lenses for this spot depending on what you want to shoot. Telephoto shots from there could be also very nice as well as wide-angle shots. Balls Head is a beautiful bush reserve just 5-10 minutes walk (about 1.5 km) from Waverton station. It offers fantastic views of the harbour, the Harbour Bridge, the city, Darling Harbour and Balmain. There is a lot of parking on Balls Head Drive, Waverton. Balls Head map on North Sydney Council web-site. The best time for photography is pre-dawn, right after sunrise, pre-sunset, sunset and up to 1 hour after sunset. You need full range of lenses for this spot depending on what you want to shoot. Telephoto shots from there could be also very nice as well as wide-angle shots. The Larkin Street lookout is located near the Balls Head, at the end of Larkin Street, Waverton. However it offers slightly different view to the city. The Harbour Bridge is almost closed by trees and you cannot see the Darling Harbour. There is a lot of parking on Larkin Street. The best time for photography is pre-dawn, around sunrise, pre-sunset, sunset and up to 1 hour after sunset. You need wide-angle and mid-range lenses for this spot. Bennelong Point is the location of the Sydney Opera House. Walking path on the bank of the Sydney Cove bay and the upper level of the Sydney Opera House ground offer great views of the Circular Quay and the city. It is only a few minutes away from the Circular Quay train station. Parking is always the problem there. The best time for photography is pre-dawn, around sunrise, after sunrise, sunset and up to 1 hour after sunset. You need wide-angle, mid-range and short telephoto lenses for this spot. The top deck of the Overseas Passenger Terminal offers superb views of the Sydney city and the bridge. Metered parking is available in the Rocks suburb nearby. 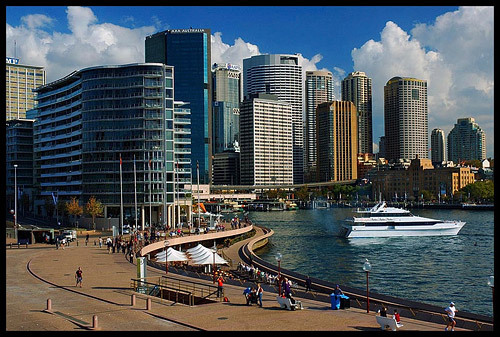 It is only a few minutes away from the Circular Quay train station. The west side of the Cockle Bay offers great views of the Sydney city. There two main spots on the west side. The south sport provides narrow view of the south part of CBD and the north sport offers excellent wide view. You can get there by Sydney Monorail, by ferry or by car. There are a lot of parking places there - large car parks or parking spots along streets. However walking is probably better as there are number of other photo opportunities nearby. The best time for photography from the Darling Harbour is second part of the day, around sunset, sunset and up to 1 hour after sunset. You need wide-angle and mid-range lenses for this spot. Bradley's Head is a small cape on Sydney Harbour and it provides superb views of the Harbour Bridge, the Opera House and the city. The lookout is located at the end of Bradley's Head Road (off Military Road) in Mosman. Bradley's Head is now a unit of the Sydney Harbour National Park and managed by the National Parks and Wildlife Service. Vehicle entry fees are $3 per vehicle per day. The park has gates that are closed at night so check opening and closing time before entering. The best time for photography from Bradley's Head lookout is pre-dawn, sunrise, after sunrise, sunset and up to 1 hour after sunset. You need full range of lenses for this spot depending on what you want to shoot. Telephoto shots from there could be also very nice as well as wide-angle shots. It doesn't matter where the sun rises or sets, it doesn't matter if the the weather isn't good, you still will be rewarded with great pictures in about half-hour before sunrise or half-hour after sunset. Half-hour after sunset even much better. The combination of illuminated buildings and darken sky creates dramatic and colorful images even on the worst days. But don't forget your tripod as low light requires long exposure. And usually buildings are more illuminated on weekdays rather on weekends. Please also make sure you check the second article as well: 10 Sydney's Best Sunrise Photography Locations.